If you follow me on Instagram or SnapChat you know that my husband and I are about to start a 14 Day Reboot Challenge this Monday where we will only be eating clean. I'll have more info about this challenge up on the blog Monday. We sat down and thought about all the not so healthy foods we wanted to stuff our faces with before we start this challenge haha. 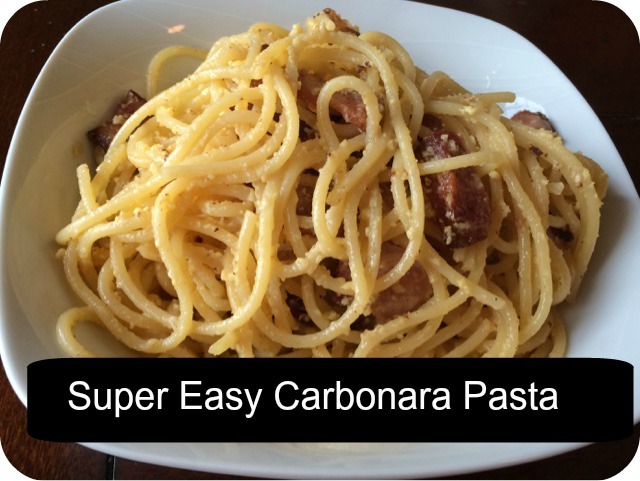 We both agreed Carbonara was number one on the not so healthy, but super easy and delicious list. My husband is Italian and Pasta is his specialty. You HAVE To try it and let me know what you think. If your like me - you'll want like 4 bowls. So so bad, but so so so so so good! 6. Add cheese of choice and pepper and serve. EDIT: We all ended up with the stomach flu and didn't do the challenge. boo.